that works like a normal phone. VePhone is an Internet Telephony application with a REAL Telephone number, allowing all users to make and receive calls over the internet as well as calls to and from conventional Landlines & Mobiles. The VePhone is a downloadable software application that runs on a windows-based desktop. The Telephone Number (currently based on UK telephone numbers with other countries to be added later), will be live wherever you are in the world when you login. Think of it as a landline that you can take anywhere you want in the world. Phone or Video calls are FREE between VePhones over the internet, as are the receiving of calls from Landlines or mobiles. Calls to Landlines and mobiles are at very low pence per minute prices according to simple country zone tariffs, with no hidden charges. 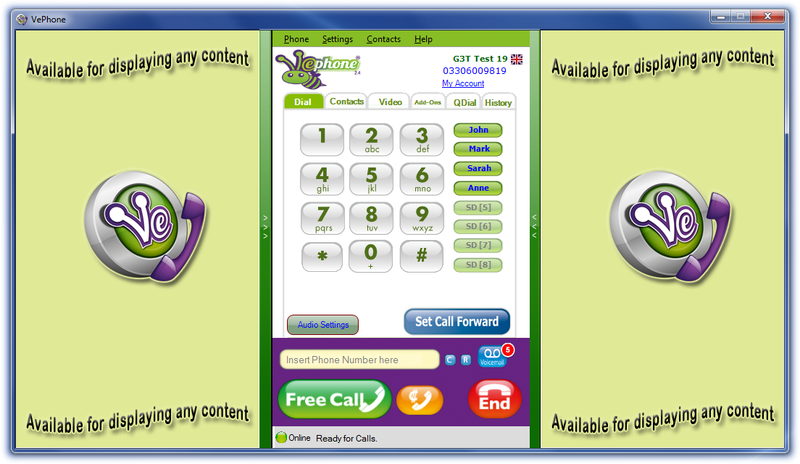 Now - you are READY to make and receive calls with your REAL Telephone number. The VePhone is great for individuals, say, at home where it is now possible to have multiple lines without being restricted to the one fixed line into the house – as all VePhone calls utilise your existing internet broadband to make and receive calls. The VePhone is great for businesses, and compliments existing PBX telephone systems. Existing conventional lines can be reduced and more flexibly freed for valuable incoming calls from customers, whereas your staff can each use their individual VePhone to make and receive calls to and from Landline, mobiles and other VePhones, simply by accessing the internet. The VePhone uses G3T patented e2e Technology to ensure that calls are direct between the two parties (calls are NOT hosted through a central server); so your calls are private and direct. With the VePhone you can make and receive Video calls and also make use of the very handy 'Snapshot', 'Text Chat' and 'Draw' features. There is voicemail as standard as well as a very useful "Call forward to Landline or mobile" feature. For call centre type environments, the 'Qdial' (quick dialler) feature comes in very handy. Visit: www.VePhone.net for further product information.